Facebook iPhone app users: the numbers keep dropping! It was only a couple of weeks ago that Facebook announced there were 102 million users accessing the site through the iphone app, along with 57 m on BlackBerry and nearly 12 m on Android. The social networking site has now changed it’s mind, and said that the figure is closer to 44 million. Or 66 million depending on what you read! The 44 m was quoted by FB to Engadget, and the 66 m is quoted on Facebook’s own page. Confused? It looks like everyone is. A company engineer recently blogged that there were 150 million people accessing the site through their mobile phones, but it looks like that figure will also have to be revised down. Which ever way you look at it, it is fair to say that FB has many mobile users, but the exact figure is now a very cloudy one. It highlights one of the many problems with mobile marketing – getting acurate data is difficult, or near impossible. Strangely, you can’t buy this any more, but it’s even stranger is that someone thought this up in the first place. Not sure what it is? 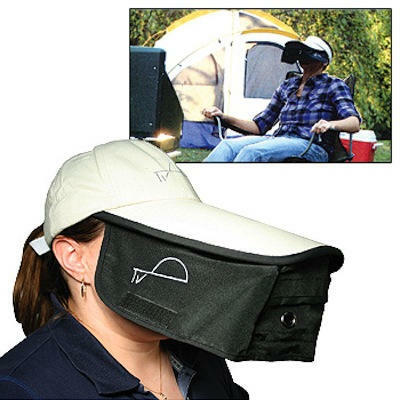 It’s a hat so that you can watch TV on your iphone glare-free. More from the top 10 most ridiculous iphone accessories here. The recent Ofcom report into UK mobile usage and operators has been widely reported online. There are a few interesting headline figures that come out of it. One of the most significant for me are the data and revenue figures. Firstly, operator revenues declined by 3.5% over the last year. Blame it on the recession? Perhaps. But I have said for a while that revenue-wise the operators are stuck in a rutt. We all have the mobile plans that we want and generally don’t want to pay any more. At the same time, additional revenue generators such as voice, SMS and now data roaming fees have been restricted through EU legislation. So, in a saturated UK market, where can mobile operators gain additional revenue? Content? Well not really because that has now been sown up by the likes of Apple and itunes. Mobile marketing and advertising? Again, unlikely with iAD and Google’s Admob getting in on the act. So from the UK perspective there is little opportunity for mobile operators to increase their revenues. It is important to take these kinds of stats with a pinch of salt. They make it clear that it does not include data revenues already bundled into tariffs: that’s iphone and Blackberry users in particular. However, the bundling aspect is significant. The fact that it cannot be separated means that the data revenue options are limited for the operators. In short, users of smartphones expect their data as part of their subscription. I have said a few times before, it is all very well talking apps and HTML5, but the big issue that will have to be addressed is data. There is little incentive for operators to invest in better data networks if there is no chance of increasing revenues. I suspect that in the short term, at least, the solution will be to limit data use. That’s something that some operators have already implemented. A handy blog here on how to disable the various Places options in Facebook.